Anyway, as absurd as it is I love being able to take a sneak peek into other people's lives to see what they just can't live without. Many times celebrity items aren't very practical so that's why I thought I'd start my own spinoff right here. The rules for picking my "Gotta Love It, Gotta Have It" objects are endless. It could fall into the category of fashion, baby, household or just plain fun. In no way am I being compensated by these companies so you can be sure that when I say I love it, I'm speaking the whole truth. If you have any particular area where you'd like to hear what my "Gotta Have It" object is, I'd love to hear from you! Ok so my object this week is...drumroll...my Kaytee Finch Feeder Sock! I used to have a finch feeder that looked like this. And for the most part it worked just fine. But the problem with these types of feeders in a climate like ours is that water, snow and ice can seep through the plastic which causes the thistle to get moldy. And finches will go nowhere near mold. So every spring I would find myself sporting rubber gloves and going in to clean out the finch feeder. Yuck! Gag me! But I do love me some finches so I did this disgusting task for them. This year I had had enough. I went to Target in search of a new feeder. I should mention that you can buy a rather expensive feeder that claims to keep all the moisture out. 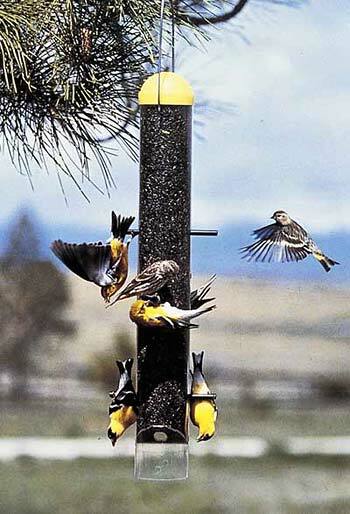 I wasn't willing to drop that much cash on a bird feeder but if you are, that may be your new best friend. Instead I found this handy dandy feeder sock for right around $4. The sock is made out of mesh so that the thistle stays in but the finches are able to eat out of the tiny holes. I can keep refilling this sock and if/when it gets moldy I'll just toss it out and get a new one. 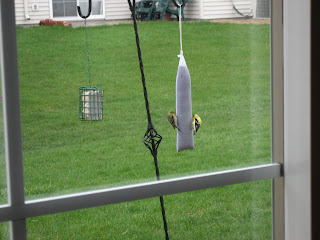 At first I was skeptical if my picky finches would take to their new feeder but after two days they can't stay away! There are our new feathered friends off to the right. The best part is that it's been so much fun for William. I keep my feeder right outside our sliding glass door in front of our dinner table so he is mesmerized at every meal. He has learned that the birds are easily scared away so when he sees one he holds his finger up to his lips and says, "Shhhhhh....!" And if the finches are in a singing mood, William will answer back with a "Tweet tweet!" I'm sure this is more than you ever wanted to know about a bird feeder but it's been making my day lately so that's why I had to put it at the top of my Gotta Love It, Gotta Have It list!